Beautiful Maui Beachfront Townhouse!! Great Views! OUR MAUI BEACH HOUSE... (Please read our Guest Comments to see how great this place is!) This is the perfect place for a family vacation and retreat!! And it is right on the beach! LOCATION: Right on a sandy Kihei beach, four miles north of Wailea. Walk just a few steps from the living room and deck to the lawn and sandy beach. Enjoy long walks on our sandy beach. Spectacular ocean views and sunsets from the living room, deck, and master bedroom - views of Lanai, Kahoolawe, Molokini, and West Maui. Kayak in front of the house to see the turtles! DESCRIPTION: A large (1,250 square feet!!) two bedroom, three bath custom redwood townhouse which we built in 1977 as a family retreat --with a fully-equipped kitchen and laundry. This is a comfortable beach house and we have done remodeling, refurnishing and updating recently. The master bedroom has a king bed, the second bedroom has twin beds and a queen bed. The duplex is on three separate levels, each with its own private bathroom. The adjoining townhouse is the only other unit on the property, and is also available for rent for larger groups. BEACH: A sandy beach with calm, reef protected waters. 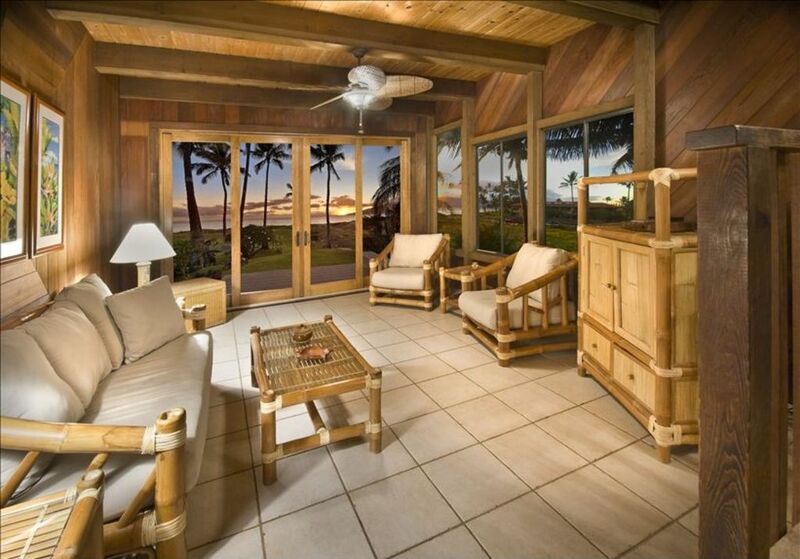 The living room and master bedroom have spectacular views of the beach, ocean, whales, West Maui, and sunsets. GOLF: Elleair Maui Golf Club is three blocks away, Wailea’s famous golf courses are four miles away, and all of Maui’s other courses are within easy driving distance. TENNIS: Public courts are a few blocks away in either direction, more are nearby. SNORKELING, SURFING, PADDLE SURFING and WINDSURFING: Beyond the reef right in front of the house, and at any of several nearby beaches. Maui Dive Shop is one block. Rig up on the front lawn and sail right from the beach. SWIMMING POOL: Kihei Aquatic Center is two blocks away. SHOPPING: One block away: restaurants, grocery store, post office, banks, bakery, etc. CLEANING: The unit is professionally cleaned and prepared before your arrival. Keywords: Right on the beach !! We built this beautiful home in 1977 and it has been our family retreat ever since. We renovated the interior a few times over the years. As you can see from the photos, this is a very unique Maui Beachfront property -- a beach house that many of our guests have returned to year after year. Right on a beautiful sandy beach !! Please be sure to see our new video in the Photo section, and to read our many 5 Star Reviews !! toilet, shower, This bath is just off the kitchen, on the living level. As you can see in the photos, nothing separates our house from the sandy beach except our lawn. We have "better than air conditioning": windows and ventilation on three sides of the building on all three living levels, with ceiling fans in the bedrooms and living rooms, and an ocean breeze! Ocean views and sunsets from this deck, with dining table and chairs, plus lounges. This is a very unique beach house for your family vacation, with spectacular views from South Maui to the West Maui Mountains, including 3 other islands: Molokini, Kahoolawe, and Lanai. Incredible sunsets. Just look at our 5 Star Reviews! As mentioned under "Air Conditioning" above: We have "better than air conditioning": windows and ventilation on three sides of the building on all three living levels, with ceiling fans in the bedrooms and living rooms, and a wonderful ocean breeze! No need for a/c - as confirmed in our Reviews. Doug was excellent to communicate throughout the process, very responsive and accommodating ! The property is a duplex half, basically right on the beach. We loved the fact that we weren't in a condo complex, surrounded by lots of others, the property is quiet and very relaxing. A previous reviewer mentioned homeless people nearby, we didn't have any issues in this regard. While there is a grassy vacant public space adjacent to the property, we felt safe at all times. Day beach visitors do walk through the vacant area to access the beach. The property has a lovely, rustic feel and you can tell that it is a favorite vacation spot for the owner's family. The master bedroom is light and bright and it is possible to lay in bed and listen to the waves on the shore if you leave the sliding door open. It does get light early, so bring an eye shade if you like to sleep late. There are three full bathrooms, one on each level so that worked great for our family of five. The master bedroom is on the top level, with the kitchen, living and dining area below it, while the second bedroom is underneath, meaning that the bedrooms are well separated which is great for noise and privacy. We found lots of turtles sleeping on the beach each night not far from the property which was a bonus ! There is also excellent stargazing on the beach at night. Good coffee can be found at Akamai which is about 2 blocks walk and there is a decent supermarket about a block away. There are an assortment of restaurants within a 5 minute walk but we mostly cooked our own meals and ate in or on the beautiful front deck. There is a great charcoal grill right out the front on the beautiful grassy area that we used a lot for meals. What a lovely vacation we had a Doug's place. Loved our stay at this Maui Beachfront townhome! We have been to Maui several times and this by far was our BEST place we have ever stayed! We loved waking up to the sound of the Ocean waves and taking morning and sunset walks along the beach. We would definitely recommend this place! fell in love with the place. No complaints at all. Everything met or exceeded our expectations. We loved the house, the location and the sunsets! The sunset view from the house is to die for. We are planning another trip this summer and hope to stay here again. The house was clean and well maintained. Take the 5 minute walk to Coconuts for the fish tacos. This house was the perfect location for a week in Maui for 2 couples. The views are stunning, and the beach in front of the house is very long, perfect for walking. The lanai and yard are beautiful and you can watch whales while enjoying your coffee. The sunsets are beautiful, we didn't want to leave at night! We saw many turtles right on the beach, but not many people which was great! The location is so convenient for anything you want to do in Maui, and even better you can walk to the store or many restaurants. The house had everything we needed for a comfortable stay. We had one minor issue and it was resolved immediately by the amazing property manager. Doug was just wonderful to work with and very responsive. We hope to return one day!! Perfect location and beautiful place! My family of 6 loved our stay here. The location is amazing. We saw a ton of turtles every morning and some would even beach themselves and sun for a while. We also saw a ton of whales. The owner was super nice and the place was well furnished. We LOVED having beach chairs provided and the owner happily brought us two more when we asked. We LOVED all the nearby stores and restaurants. We walked to eat every day and to get our groceries. The lack of air conditioning did not bother us at all. My wife NEEDS her air conditioning, but you get such a perfect breeze that we were actually chilled at night in the master bedroom. The 2nd bedroom was a little stuffy the first night, but otherwise, we heard no complaints about it. There are a couple things you should keep in mind when staying here. There are a lot of homeless people around and you will see them in the yard throughout the day. The master bedroom has very little privacy. There are a ton of windows and doors (which are beautiful for seeing the ocean) but also make it so that anyone walking around can see into your room. Also, there is no door or curtain separating the master from the downstairs, so anyone in the kitchen/laundry room can see straight up into your room and see you lying in bed. Anyone coming from the 2nd floor bathroom gets a perfect view into the master. This can make changing and intimate moments a lot more difficult. I think adding a curtain at the top of the stairs could help a lot with this. The home feels a little dated, so please do not come expected everything to be brand new. There is only 1 TV in the house, which is in the living room. Lastly, the home didn't really feel secure when we would leave. Some of the windows are hard to close and lock. Perhaps stealing is not a problem in that area, because we had no problems but we were a little worried about our things when we would leave the house. I would happily stay here again and hope we get the chance to in the future. What an awesome place. Please do not hear the negatives and think this isn't an awesome place to stay. I only wanted to prepare proper expectations. I HIGHLY recommend this home! The $500 Refundable Security Deposit is paid by credit card in order to book the reservation. The balance of the rental fees are to be paid by check 60 days prior to arrival.